Saint Mary School Celebrates National Foreign Language Week! Saint Mary School (SMS) in Ridgefield joined schools across the country celebrating National Foreign Language Week, which has been celebrated annually since 1957 when it was introduced by the National Collegiate Foreign Language Honor Society, Alpha Mu Gamma. "The goal of the week is to increase awareness to American students of the value of studying foreign languages," says Anna O'Rourke, SMS Principal. "We firmly believe in the importance of learning another language and being exposed to different cultures. Our students start studying Spanish in preschool at age three, and continue through their years at SMS," she says. A wide variety of activities were planned to appeal to students of all ages. Morning prayers were recited in different languages, including Spanish, Italian, Romanian and Mandarin. There were daily trivia questions, a bake sale to benefit UNICEF, Middle School students reading in Spanish to younger children, and an international themed buffet for lunch. 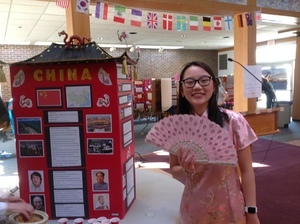 Assistant Principal and Middle School Spanish teacher Elizabeth Manno explained, "The culminating activity was our World Language Expo, which highlights the geography, culture, dress, food, art, music and history of countries around the world." Manno says the entire school community; students, teachers, parents, staff, and even alumni home on spring break enjoy visiting the Expo. "The Expo develops our students' skills in research, creativity, time management, and public speaking, and expands all of our knowledge of other cultures." To schedule a tour of Saint Mary School, call 203-438-7288. To learn more about the admission process, click here. Saint Mary School is located at 183 High Ridge Ave in the heart of Ridgefield.